Genuine OEM Xerox Solid Ink Sticks, Yellow, 17,300 page yield. Contains 6 solid ink sticks. Xerox part number: 108R00952. Solid Ink Sticks compatible with Xerox ColorQube 8870, 8880. Genuine OEM Xerox Solid Ink Sticks, Cyan, 17,300 page yield. Contains 6 solid ink sticks. Xerox part number: 108R00950. Solid Ink Sticks compatible with Xerox ColorQube 8870, 8880. Genuine OEM Xerox Solid Ink Sticks, Magenta, 17,300 page yield. Contains 6 solid ink sticks. Xerox part number: 108R00951. Solid Ink Sticks compatible with Xerox ColorQube 8870, 8880. Genuine OEM Xerox Solid Ink Sticks, Black, 16,700 page yield. Contains 6 solid ink sticks. Xerox part number: 108R00953. Solid Ink Sticks compatible with Xerox ColorQube 8870, 8880. Genuine OEM Xerox Extended Maintenance Kit, High Capacity 30,000 page yield. Xerox part number: 109R00783. 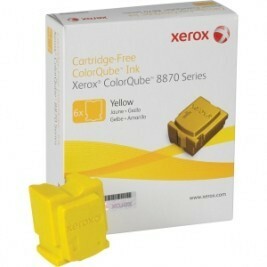 Extended Maintenance Kit compatible with Xerox ColorQube 8570, 8580, 8870.